The Arcata Tigers played the South Fork Cubs in last Friday’s junior varsity game, played on McKinleyville High School’s football field. Into one clump of fans a question had just been tossed: What did they think of Measure Q, the $25.8 million school bond on the Nov. 2 ballot that aims to bring everything from new all-weather artificial turf and modern aluminum bleachers for this very field to a performing arts center and possibly an all-weather track down on Arcata High's campus, plus a host of technological, electrical and other upgrades on both campuses? Keeping one eye on the game -- there goes No. 32, touchdown! -- a couple of them admitted they were just now trying to educate themselves on the measure. But, said one of them, he didn't know why McKinleyville High needed an all-weather field. "We played on this field when I was in high school," he said. "Winter mud has always been a part of football." "Slip and slide," added the woman sitting next to him. But then another guy said, well, a lot of other teams and community groups, and not just football, use McKinleyville High's fields now, and they get torn up in wet weather. As a result, some groups have had to be excluded to save the field -- like Arcata's Youth Football program, for instance. The first guy said, well, then maybe the all-weather turf is a good idea. And finally they concluded that they actually liked everything the bond measure proposed; they just hoped every project would actually get funded. No doubt there have been similar conversations throughout the Northern Humboldt Union High School District's communities. What does Measure Q provide exactly, and will it be equitable? Does Arcata High need a $7.2 million (estimated) community performing arts center? 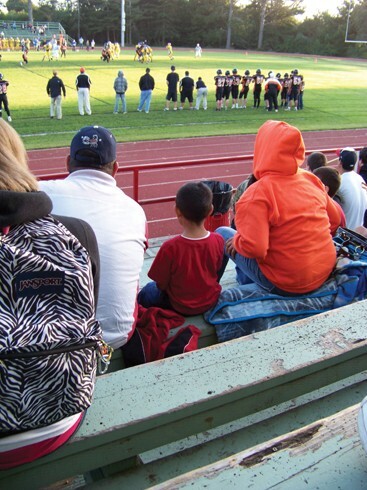 Does McKinleyville need aluminum bleachers (about $2.6 million) and all-weather turf and other physical education facility improvements (about $4.2 million)? The Humboldt Taxpayers League has spoken out against the measure. McKinleyville resident Scott Baker wrote a letter to the Times-Standard opposing it. "It's not so much that [all those projects] are not worth it," said Baker by phone on Tuesday. "But the bond bothers me because of the economic situation -- lot of people are doing without these days. Why can't they? ... And a lot of the stuff they're buying with the bond, like computers, will be outdated by the time the bond runs out." Meanwhile, others, including Arcata alumnus Zachary Zwerdling, have started a pro-Measure Q Facebook page. Measure Q asks for property owners in the district to pay $19 tax per $100,000 assessed value of their property, in return for a slew of modernization and repair projects at the district's anchor campuses in McKinleyville and Arcata. Last Friday, in an interview in his office next to McKinleyville High School, Northern Humboldt Union High School District Superintendent Kenny Richards said he's heard mostly positive reactions to Measure Q. A survey conducted for the district found that 58 percent of voters leaned in favor of it -- and they happened, by chance, to be a rather conservative bunch, said Richards. Richards said NHUHSD is the largest school district in California to have never asked for such a bond. But with declining state revenues, the district's had to reduce its budget: by $2.76 million in 2009-2010, and by $2 million in 2010-2011. On top of that, the state this year withheld 25 percent of the district's money, saying it would deliver it next year. The budget's balanced this year, but the district could be nearly $1.2 million in the hole by next year. In recent years, the district's had to lay off teachers and cut staff and defer repairs. Meanwhile, Arcata High, built in 1948, and McKinleyville High, built in 1961, continue to age or no longer serve the schools' needs appropriately. The Armack Orchestra is cramped into a too-small space at Arcata High. McKinleyville's grass fields, easily muddied after a rain, are being used to death by multiple school team sports from both towns and by community youth and adult sports groups; the youth football program alone plays 70 games on the field -- but with new, artificial turf, that wouldn't matter, and Arcata's youth could play there, too, said Richards. There's more: Arcata High's gym has just one women's toilet. Both schools' computer systems are five to 10 years old and their software harks to 2003. Their libraries are outdated. Arcata High's track teams have no track and have to run around the parking lot. The bells at McKinleyville High need re-wiring; some don't even ring. The clocks are all a-cuckoo, too. Arcata's solar panels need expanding and McKinleyville High doesn't have any yet. And so on. Richards said it's true that computers will become outdated again over the 25-year life of the bond, but that during that period there could be more than just one upgrade funded by the bond money. Richards noted also that Measure Q would impose a much smaller tax than similar bonds passed this June by other local school districts: Blue Lake ($30 per $100,000 assessed value), Rohnerville ($30) and Southern Humboldt ($60). "So, we thought we were being prudent," Richards said. If the bond passes, a citizens oversight committee would be formed to help the board decide which projects to do first. And both schools will receive roughly equal amounts of money, Richards said. In addition, $1.29 million of the bond would go toward paying off what the district owes on money it borrowed to match a state grant about 15 years ago that went toward an earlier round of modernization of classrooms and indoor gym facilities. "We didn't ask the voters for money then," he said. "But times have changed. We're a declining enrollment school, and we don't qualify for modernization grants now. But you can't have things falling apart."